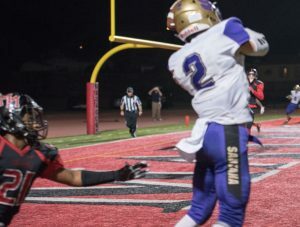 SPRING VALLEY (11-3-2017) – Whether it was from the computers or the local press, the contest between the Mount Miguel Matadors and Santana Sultans was about as close as it was forecasted Friday night. With just 5 minutes to kickoff, a special night for the hosts’ senior class kicked off the festivities with parents on the sidelines, but for the two teams that matched up well and with playoff implications, the stadium looked like a deserted island. No matter, as this contest would prove well worth the wait as the game progressed. 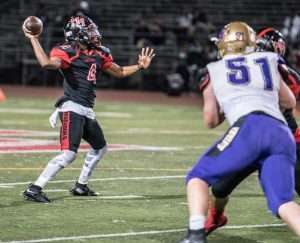 Mount Miguel earned an eventual lead in a penalty-plagued struggle, then held off charging Santana, 26-24, in the Grossmont Hills League finale. The Matadors received the kickoff, then signal-caller MUGABE MILLER positioned himself under center. However, the first pass of the game intercepted by Santana outside linebacker CAMERON LARICCIA, leaving it 1st and 10 Sultans from about the Santana 25. The Matadors and Sultans couldn’t decide who wanted to pile up more laundry on the field, with false starts, encroachment flags, and even personal foul penalties. The Sultans late in the 1st quarter put together a decent drive only to be shut down with a JOSH OEDEWALDT pass picked off by defensive back ERIK GRAHAM and a touchback for the Matadors. The 1st quarter expired just seconds later with a scoreless tie. 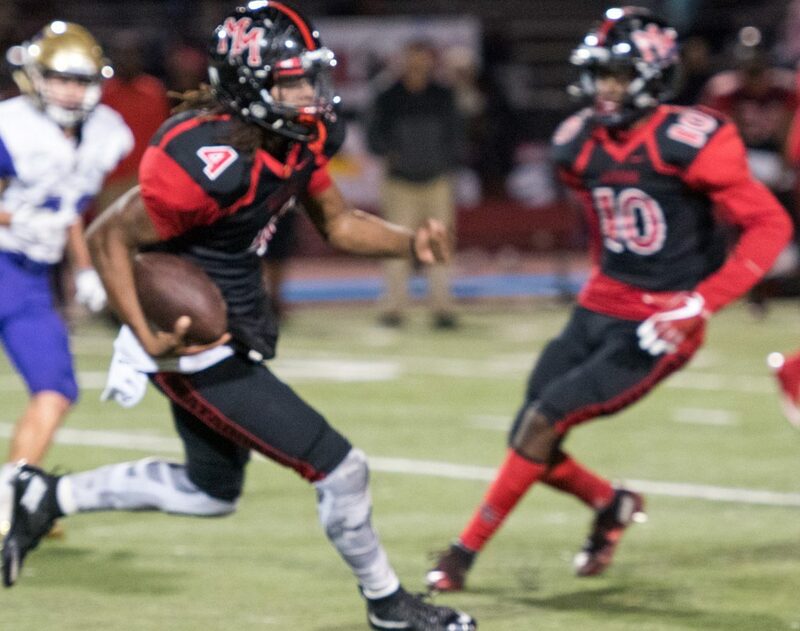 During one sequence, the Matadors found themselves in a fourth-and-49 situation. The Matadors were not only shooting themselves in the foot for penalties, as 3 snaps in the first half went over Miller’s head, including one recovered by Santana late in the 2nd quarter. However, Miller had a javelin-like throw to running back SHEMAR GREENE while he was under heavy duress for a 50-yard acrobatic catch. The Matadors were called back on yet another penalty, negating the 1st down. Santana would score on their next drive consuming the clock, although, despite a goal-line defense stand, Oedewaldt scored on a 1-yard keeper up the middle with 45 sec remaining in the second. The extra point was good to make it 7-0 Sultans. The Matadors would fail to score before the half. Halfway through the 3rd quarter of play and some, there were some decent runs by Sultan personnel, namely running back IAN LITTEN, fighting for that yardage, and looking very former 49er Tom Rathman-like, ultimately settling for a 25-yard field goal by TIMMY TISCHER with 6 minutes remaining in the 3rd, making it 10-0 Sultans. Mount Miguel (4-6, 2-2) was definitely rejuvenated at the intermission, as the Miller would not be denied, adding his speed and athleticism, scurrying down the field and into the end zone on a long TD run. However, the extra point was blocked leaving the score 10-6 with 5;36 left in the 3rd. The Matadors would score again, as for the second time in the second half, DB/WR SANTINO PACHECO would have a big punt return, this time for a 65-yard TD with 7:44 left in regulation. Mount Miguel RB SHEMAR GREENE added a leap into the end zone for a successful two-point conversion, upping the score to 20-10 Matadors with 7:44 left. The Sultans tried to put together their own comeback as Mount Miguel defensive back ANGEL ARMENDARRIZ picked off a pass and returned it 48 yards to the 2-yard line. The next play was a handoff to Greene off tackle for the next score, increased the lead to 26-10 with a failed two-point conversion and 4:55 left to play. Oedewaldt was doing a little dink-and-dunk down the field, with a couple of those passes caught by wide receiver COLTON SNIPES. A few plays later, Oedewaldt was in with another keeper in for the score and a two-point conversion made it 26-20 Mount Miguel with 3:37 left in the contest. The Santana defense played tough especially on the last Matador drive for a three-and-out. It looked like Oedewaldt may have been able to just tie the thing and head into overtime. With 1 minute remaining on 3rd and goal, Oedewaldt rifled a strike to WR CAMERON KANE for a 10-yard score and threw incomplete for a failed 2-point conversion. The Matadors went into victory formation, takin a knee twice as the Matadors prevailed, 26-24. 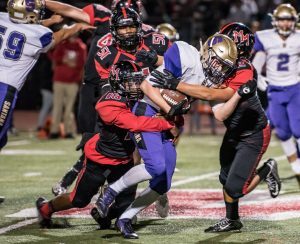 The Matadors were hoping to move up at least one spot in the rankings to host a SDCIF Division 4 opener next Friday. Santana (4-6, 1-3) will certainly be on the road in the D4 playoff opener next Friday.